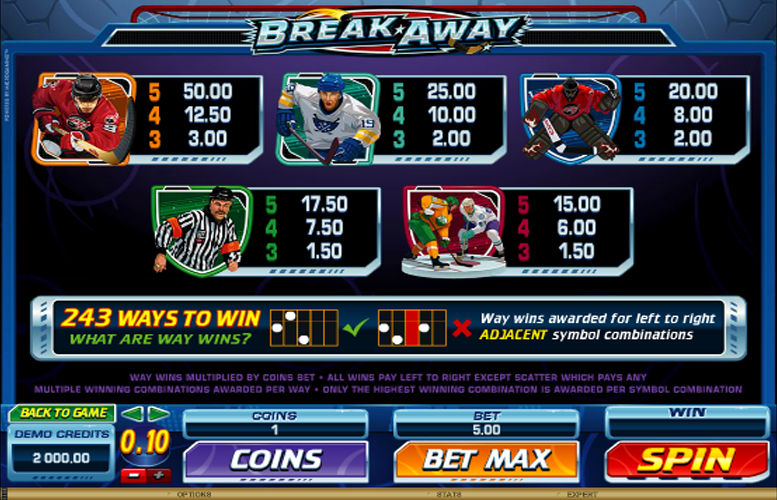 Break Away is a slot game which will appeal to those players who like the high octane action which ice hockey delivers. The three row, five reel and 243 ways to win format game is set on a rink and utilises fun sound effects and graphics which make you feel like you’re right at the heart of the action. What’s more, the slot also packs in loads of fun gameplay features include wild symbols, a related Smashing Wild Feature, free spins and a potentially very lucrative Rolling Reels Feature during those free spins. Those added gameplay elements help to boost winning potential, but the game’s standard payouts are perhaps a little disappointing. The slot’s theme is well executed, with good graphics, attractive symbols and well-applied background sound effects all adding to the feeling that you’re really at a hockey game. Wild Symbols, the Smashing Wild Feature and the chance to trigger free spins with a very lucrative Rolling Reels Feature, make gameplay immersive and enhance winning potential. A decent range of betting options are available to players, with them able to independently alter the number of coins bet per spin and the value of each of those coins. If you don’t trigger free spins or get your number of winning combinations boosted by the Smashing Wilds Feature, the Break Away payouts are a little disappointing. An ice hockey themed game is simply begging to have a shootout related bonus round or sidegame, but no such feature is forthcoming. 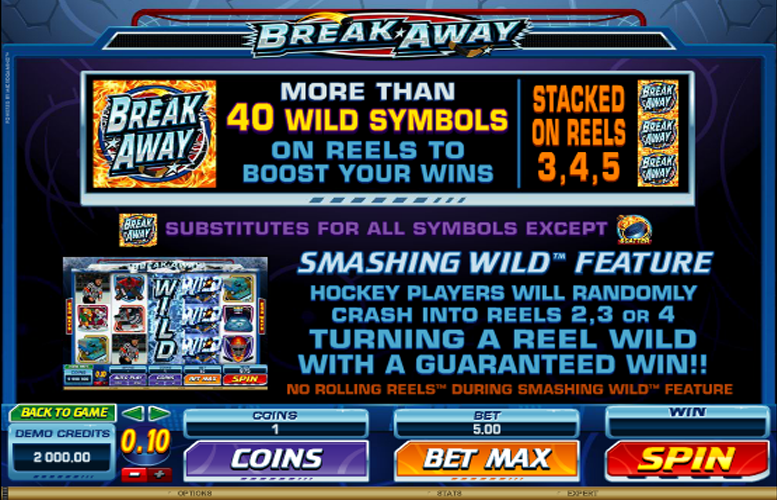 While Break Away does not have a bonus round or second screen game, it does feature loads of wild symbols and a related special Smashing Wilds Feature. The wild symbols substitute for all other symbols bar the game’s scatter and can be stacked on reels three, four or five. Randomly during gameplay, a player will also smash into either reel two, three or four turning the entire reel wild, as per the Smashing Wilds Feature. It’s the flaming puck scatter symbol which is the one which Break Away players will want to see most. Three, four or five of those anywhere on the reels trigger 15, 20 or 25 free spins respectively. What’s more, five scatter symbols also pay out at the highest possible rate of 250 times a player’s total bet. Respins cannot be retriggered once they have begun but during any set of free spins, the slot’s Rolling Reels Feature can award multiple consecutive wins and will award an up to 10x multiplier to boost all winnings. 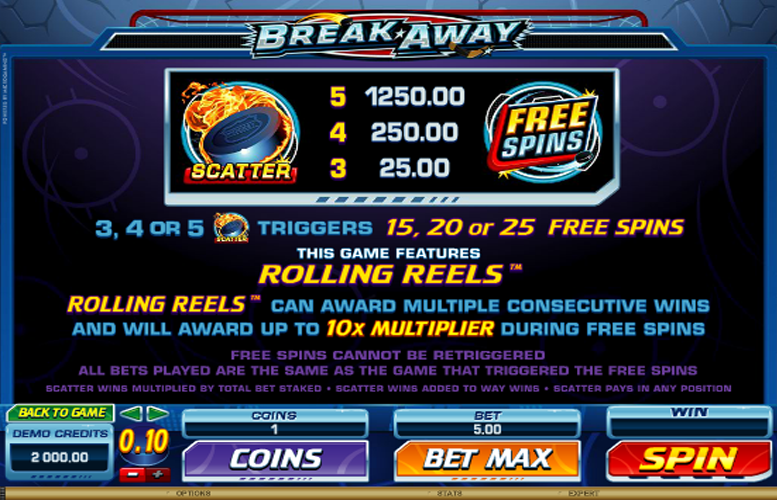 As Break Away is a 243 ways to win slot game, players do not have the choice of altering the number of active paylines. The way they can change their bet per spin, therefore, is by choosing the number of coins to bet and setting their desired coin value. Once they have done that, their choice will have a 50 x bet multiplier applied. Each spin can have between just one and a maximum of ten coins wagered on it, and those coins can be set at values of between 1p and 20p. A minimum bet of just 50p (one coin worth 1p x 50) is therefore possible, as is a maximum bet of £100 (ten coins worth 20p x 50). 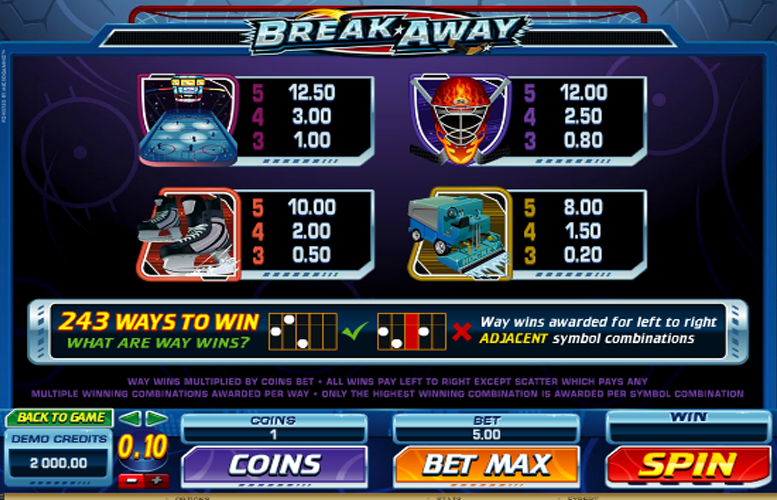 Break Away is a slot game with a fun and innovative theme, which is pretty nicely executed. Good graphics and realistic sound effects create a very real feeling of being at a hockey game but it’s perhaps a little disappointing that a hockey specific bonus game isn’t attached to the slot. Speaking of being a little disappointing, Break Away’s standard payouts are unquestionable on the stingy side. Without scatter wins or the Rolling Reels multiplier associated with free spins, the top jackpot available is worth just ten times a player’s total bet. Those features mentioned above, along with the game’s wild symbols and Smashing Wilds Feature, do add extra interest and winning potential to the equation, however. All in all, then, Break Away is a well themed, reasonably immersive slot which can pay out nicely as long as you’re lucky enough o trigger one of the additional gameplay features.